After stopping in Telegraph Cove (see yesterday’s post) we head back onto the water for the second half of the day which means stellar sea lions in the spring and fall as the migrate between California and Alaska. This September day is unusual because all seems quiet on the sea lions haul out. 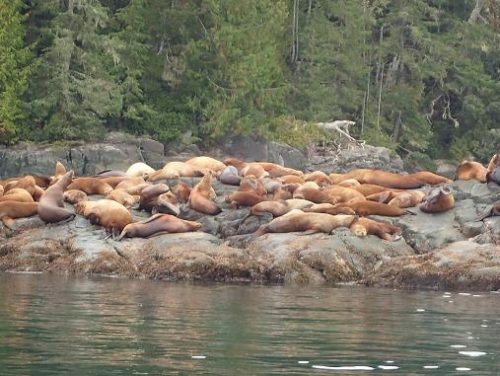 Normally when there are this many stellar sea lions on one rock it becomes a mass of moving bodies with all of them wanting their complaints heard. On the better evenings we may find a grizzly with cubs. Over the past five years the numbers of the grizzlies in the area near Grizzly Bear Lodge (named for a reason) has increased dramatically. The grizzly population of Knight Inlet is on the increase and the young males and mothers with cubs are moving down the inlet closer to the lodge. The competition for food forces the bears into areas they previously avoided and this makes the evening viewing much more interesting.